Make and receive calls with an Arduino. Tutorial and sample code for the GPRS Shield. 1. We will first test the AT commands on a computer. For that you will need an Arduino board without the ATMega microcontroller chip. Arduino 0018 in the lab should be like this already. If you need to take out the chip from your Arduino, do it carefully with a screwdriver and be careful not to bend any of the pins of the ATMega. 2. 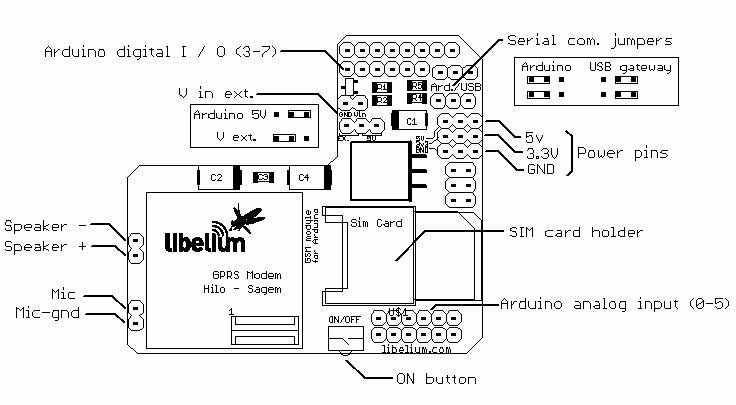 Plug the GPRS Shield to the Arduino and insert a SIM card. 3. Connect a small speaker to the speaker pins on the shield. This is really useful for debugging your process. 4. Set the Serial com. 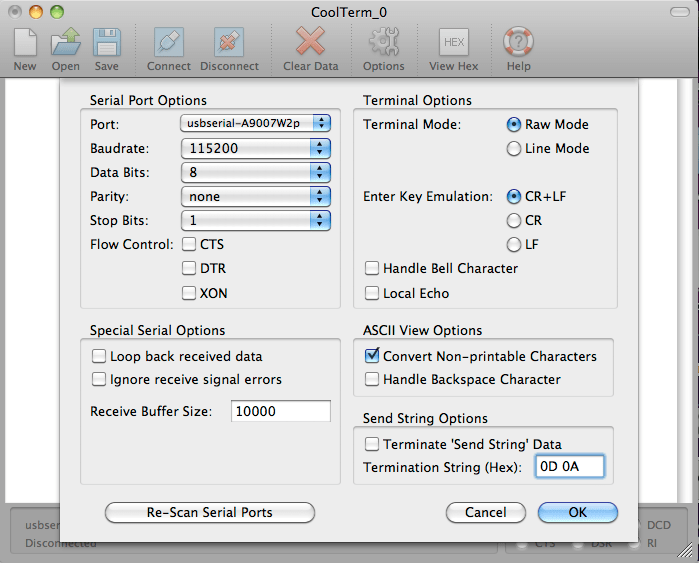 jumpers on the shield to USB gateway and the power jumper to Arduino 5V. Use the schematic image above for reference. 5. Connect the USB cable of the Arduino to your computer and also connect an external power supply to your Arduino. Libelium recommends a 12 V / 2 A power supply. The external power supply is needed because most USB ports do not provide enough current for the shield when it tries to connect to a network. 6. We are going to use CoolTerm to test the shield. Download and install it. 8. Click OK and then Connect. You should now be connected to the Arduino board. 9. Turn the shield on by pressing the ON/OFF button for two seconds. The speaker should beep two times. You should get a reply of OK.
Where **** is you PIN number. You should get OK as a reply. NOTE! I recommend disabling the asking of the PIN code on your SIM card. I find that it causes some problems connecting to the network. This means that the module is able to read the SIM card. If you don’t hear the sound. Disconnect CoolTerm, disconnect the USB cable and disconnect the power supply. Connect them back and try again. If you get +COPS: 0, it means that the module is not connected to the network. Wait for it to connect or restart it. Download this .pdf for a complete list of all of the available commands. 1A(hex) => end of message. // In CoolTerm you can enter the 1A hex code by pressing ctrl+z on your keyboard at the end of your message text. If you have problems getting the serial communication to work properly, try uploading the code with an older version of the Arduino software, such as Arduino 0016.